SAN FRANCISCO, CA--(Marketwired - Nov 11, 2013) - Pure presents Contour i1 Air, a compact and powerful digital music system featuring Apple's wireless streaming technology, AirPlay* for wireless audio streaming from iOS devices or iTunes. Contour i1 Air ($199 MAP) is Apple certified and comes with a beautifully engineered revolving dock with clip in adaptor that will accommodate iPod, iPhone and iPad models with BOTH 30 pin and lightning connectors. 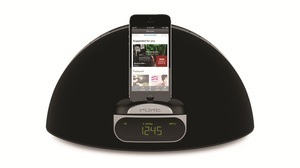 "Despite the growing trend towards streaming music wirelessly, consumers still want and need to charge their Apple devices," says Noam Meppen, Pure's Director of Sales, U.S. "Contour i1 Air offers the best possible flexibility and gives users the choice of docking older or newer Apple models as well as enjoying their music collection wirelessly in great audio quality from the comfort of their sofa." Contour i1 Air is an ideal companion to the free Pure Connect** app which enables access to over 20,000 global internet radio stations, in excess of 200,000 free on-demand programs and podcasts as well as millions of streamable music tracks via Pure's subscription music service. All content from the Pure Connect iOS app can be streamed wirelessly to Contour i1 Air. Building on the success of Pure's existing Contour family of docks, Contour i1 Air benefits from the same contemporary styling and powerful audio and comes with a clever, revolving dock that can be tucked away when the dock isn't being used. Benefitting from Pure's heritage of British design and engineering, Contour i1 Air delivers vibrant, high-clarity room-filling sound with 20W RMS of audio power. Other features include easy Ethernet or Wi-Fi network setup; input for other audio devices and a full-function slimline remote control with magnetic remote tidy. Contour i1 Air is available now at amazon.com. Please visit www.pure.com/us for more information. * AirPlay enables iTunes users to play their music library, hosted on a Mac, PC, iPad, iPhone or iPod touch on any AirPlay-enabled device such as the Pure Contour 1i Air. If the user has more than one AirPlay-enabled device, the user can control and run a multiroom music environment from a PC or Mac running iTunes. Take your music wherever you go: online and off. One app-tap downloads your playlists so you can listen wherever you are. Pure is a world leading consumer electronics manufacturer and leads the way in music streaming and radio systems and entertainment cloud services with the Pure Connect portal www.pureconnect.com as well as innovating in new areas such as the TV set top box market. Designed and engineered in the UK, all of Pure's products are manufactured with the environment in mind and at ethically audited facilities. Pure is a division of Imagination Technologies Group plc. See www.pure.com. Pure's Contour i1 Air is now shipping, offering the flexibility of BOTH 30 pin and lightning connectors.